Today's point of interest is the public laundry in the very old neighborhood of El Chorro. This is a series of basins with a water trough above them fed by a spring. This was the old traditional public laundry area of the city where the women came to wash clothing. Apparently, they still do. Here is a link to a photo under the protection of copyright portraying the San Miguel Laudromat in action. I walked over to see this today, and I think the old public laundry overrated as an attraction. Still, the old neighborhood itself is truly beautiful, and I will go back for that fact alone. This is the view out over the lower part of the city from the balcony of the Café Chorro where I could not only enjoy this view but purchase the cheapest coffee I have found yet. What are we going to do about these beggar ladies? 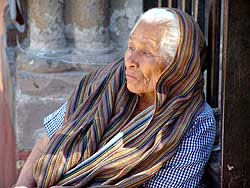 Because of the inadequate social safety net in Mexico, one is continually confronted with elderly women, widows one presumes, with no family to take care of them who are reduced to begging in the street, in the plaza, and everywhere else in public. Here is another. It is the little lady with her back to us. She was working the shaded part of the plaza that I like so much, which is officially known here as El Jardin (“The Garden”) by the way. I have been handing out a peso here and a couple of pesos there, but I cannot afford to support all these women. There is nearly one per block. Here's my idea. I am going to pick out a couple that I can recognize, and every time I see one of them I will contribute. The others will have to do without me. Anybody have a better idea? I have to backtrack a bit on my quick enthusiasm for the tortillas. They are still delicious today, but they do not take peanut butter worth a damn. I had to buy a loaf of bread and get the toaster out again. I do not wish to have the resident Americans here included within the ambit of my acid remarks of yesterday about American tourists. The residents are cool and quit a trim lot since they walk up and down hills so much. These gals, Carol and Norma, maintain a wonderful web site called Falling in Love with San Miguel. 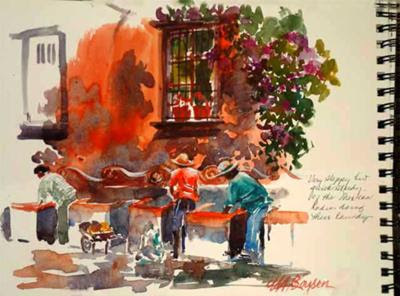 And there you can also purchase a copy of their book, Falling. . .in Love with San Miguel: Retiring to Mexico on Social Security. Give it to some old person you want to get rid of. The close-up picture of the beggar woman is outstanding, Steve. You should enlarge it, try to sell it and then give your profit to her. My usual solution is to give to performers in the streets, but others grab my heart as well. I am laughing, Barb. Actually, that one is excellent, isn't it? It is not my picture. I lifted it, and it is undoubtedly under copyright. I myself have trouble taking pictures of these ladies, although they do make fascinating subjects. There is something that feels unseemly about it to me. Perhaps the answer is to pay them a couple of pesos to take their picture.